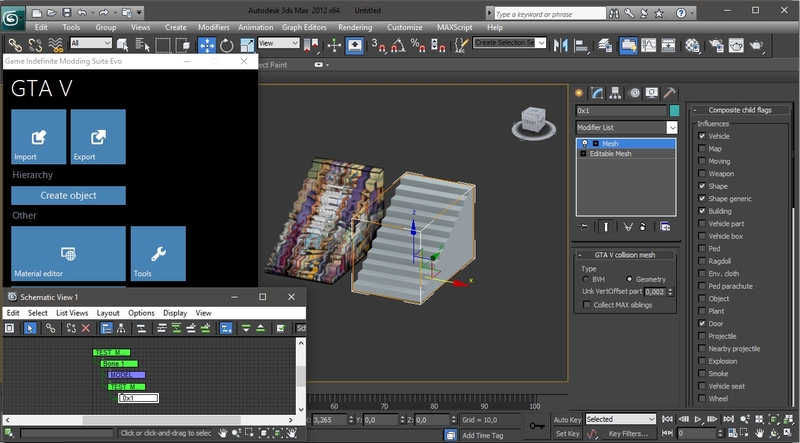 Videotutorial with GIMS Evo for GTA V creating and exporting a .ydr object with embedded textures and collision geometry. Includes essentials notes. - 3DS Max 2017 Service pack 3 (Student) but is recommended 3DS Max 2012. - I used a GTA V ped model (named in the tuto as "_GTAV_PED REFERENCE") as reference to get the correct scale for the stairs model, is recommendable to use one in your viewport to stay advised in the correct scale for the game. - Not use geometries for collision with more than 100 polygons to not affect the game performance when collides our object. - To agilize performance, the game uses "power of two" square textures (that is width equal to height, in sequences of two to make possible the mip maps compression), so we need to use always a final dimension like 128x128 pixels, 256x256 px, 512x512 px, 1024x1024 px, ... etc. Q: ¿Why is not visible my object when I walk away? A: You can set de LOD distance (where we put the 1000 value) in 9999, but if you just replaced any game object, the visible distance is not managed by our model cause is assigned by the game in a metadata file (.ymt and .ytyp). If you need long view distances and don't know how to edit the game metadata files, use a Add-On props mod to asign more view distance to your object. Q: ¿I can use bones in the ydr? A: You can, just connect the bones to the main parent and the models and collisions to the desired bone, being careful in apply different ID number for each bone. Rarefacer: "The human is alive, the way to learn and live is being homo ludens (man playing). Enjoy the world".